Rainbow Riches: Drops of Gold is the latest in the Rainbow Riches series to come from Barcrest. If you are a fan of fun themed slots, come play Drops of Gold at Rocket Bingo today. It is immediately obvious that time and attention has been lavished onto this game to make it look as beautiful as it does. The background immediately takes you to a lush fantasy realm ready to get settled down to play. Each of the reels and panels is surrounded by golden Celtic designs and the side panels are also surrounded by gold coins, reminding you of the ones you are bound to win. The reels continue with this grand Irish theme. Of the symbols a slot fan might recognise - the 10, J, Q, K, or A – it can clearly be seen that they are reminiscent of an ancient manuscript’s lettering. There are also some unique tiles, as is to be expected amongst the themed slots. There is a silver horseshoe, a fiddle, a Celtic harp, some mushrooms, and the Rainbow Riches logo surrounded by gold. Other tiles include the glimmering gold and silver pots ofcoins on the vast and vibrant upper reel, the small colourful Bonus tile and the red and gold Drops of Gold banner. All of these latter tokens are used in the slot’s exciting Bonus Features. 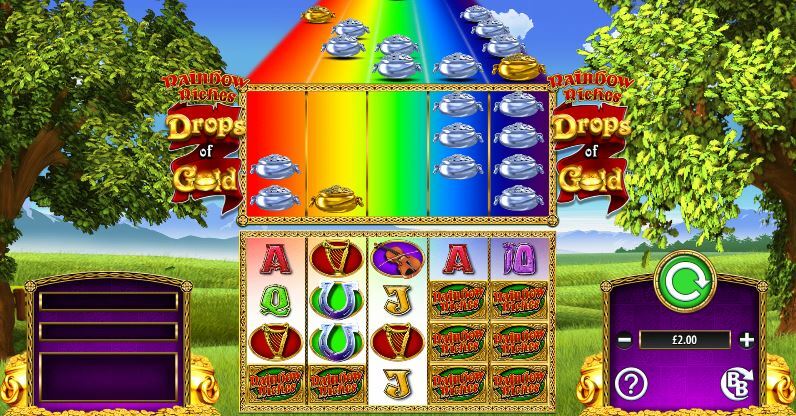 To play Drops of Gold, you simply have to enter your preferred wager on the right hand control panel and then use the green spin button to set the reels turning. Although the game may initially seem challenging because of its all its variables, it is not as complicated as it seems. Beneath the bet table and the spinner, you can find more information about the game as well as the link to the Big Bets feature. Drops of Gold has many fantastic extras which are sure to delight even the most seasoned of slot veterans. The first we shall examine happens to be the one the game is named after; the Drops of Gold feature. This feature activates your wilds and lands you with the chance to grab a massive win across multiple paylines. If your spin ends with a Drops of Gold banner on the 5th reel, prepare to be amazed as any pots in the upper rainbow reel jump down and turn wild. The second amazing feature Drops of Gold can offer is the Free Spins bonus. All you need is 3 of the colourful bonus tiles across your reels and you are successfully into the free spins! To start you off, you will be given 8 but, don’t worry, for every additional Bonus tile you collect you will get another 4. Finally, there is one more feature available in Drops of Gold; the Big Bet. Simply click the button beneath the betting panel and browse the menu you are offered beyond. Each of the 3 Big Bet scenarios lasts for 5 rounds and offers you the chance to land a fantastic jackpot. Who needs a Leprechaun to show you to the gold at the end of the rainbow? With Rainbow Riches; Drops of Gold, you are more than capable of finding that stash all by yourself!